are citizens, leaders, volunteers, corporate executives, public figures, celebrities - everyday people carrying the message that we are part of a world wide community that seeks to raise our voices and celebrate our journey. are all about commemorating the positive impact that recovery from mental and substance use disorders has had upon our lives and those of our families and friends. We want to share the wonderful hope we have for others to do the same. 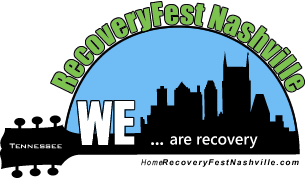 RecoveryFest Nashville is a grassroots movement about celebrating the positive impact of recovery from mental and substance use disorders and giving it the visibility and attention it deserves. It doesn't matter if you started on your recovery journey one hour ago, or twenty years ago. We may not have met yet, but we’re on the same journey. It’s about pursuing a healthy lifestyle and making better choices. Recovery isn't an easy journey and one of the keys to success is not trying to make the journey on our own. We each need loving, supportive people in our lives to encourage us and walk with us. We need each other. And when we move forward and make the right choice, we need to celebrate our success! We believe we all have a right to recover, free from stigma and discrimination, with access to a variety of pathways to healing. The right to recover from mental and substance use disorders is a human right. Promote common interest in the prevention, education, and treatment of mental and substance use disorders. Promote recovery and available resources. Provide a place for networking and cooperation with all agencies interested in the health and welfare of the community. Educate the public regarding substance use disorders and other addiction/mental health issues, emphasizing that it is treatable and people can and do recover when given the right type of support. To fellowship and celebrate with individuals and families in the recovery community. To support those who are still suffering and need help with substance use disorders and/or mental health treatment and recovery support. That’s what RecoveryFest Nashville is all about. We want you to be part of the fun. We’re looking forward to meeting you at RecoveryFest Nashville this year.